By Jim Dower: A match between former heavyweight world title challenger Kubrat Pulev (26-1, 13 KOs) and Robert Helenius (28-2, 17 KOs) is in the works for the undercard of Terence Crawford vs. Amir ‘King’ Khan on ESPN PPV on April 20, according to Dan Rafael. Pulev vs. Helenius is being negotiated. This will be an interesting fight between two big men. Helenius is the bigger puncher of the two. Pulev is the better boxer, and the guy with the far better jab. Helenius will need to put pressure on Pulev to try and get him out of there if he wants to win. Pulev, 37, recently signed a co-promotional deal with Top Rank Boxing, the promoters for the 31-year-old Crawford, so they’re looking to put the popular Bulgarian heavyweight on the undercard against a well-known fighter in 6’6″ Helenious. Pulev is the International Boxing Federation mandatory for IBF heavyweight champion Anthony Joshua. Pulev recently defeated Hughie Fury by a 12 round unanimous decision in an IBF title eliminator last year on October 27 to become Joshua’s IBF mandatory challenger. Pulev is now waiting for the IBF to order the fight with Joshua. This would be the second time that Pulev would be scheduled to fight Joshua. In 2017, Pulev was supposed to fight Joshua, but he suffered a shoulder injury during training, and he had to pull out of the fight with a week to go. Carlos Takam, who Matchroom Boxing promoter Eddie Hearn had on standby, stepped in and fought Joshua at the Principality Stadium in Cardiff, Wales. Helenius, 35, has won his last three fights since losing to Dillian Whyte by a 12 round unanimous decision on October 27, 2017 in Cardiff, Wales on the undercard of Joshua-Takam. Helenius hurt Whyte late in round 2 after nailing him with a big right hand to the head. Unfortunately for Helenius, he ran out of gas and was dominated the rest of the way. Whyte didn’t look great in winning though, as he struggled with the height and reach of the much taller Helenius. Since that loss, Helenius has won his last three fights in beating Erkan Teper and Yury Bykhautsou [twice]. Pulev, 6’4 1/2″, has to be seen as the favorite to win this fight. Pulev is a 2008 Olympian for Bulgaria. He spent a lot of time in the amateur ranks, and subsequently got off to a late start to his pro career in 2009. Pulev fought former IBF/IBO/WBA/WBO heavyweight champion Wladimir Klitschko in 2014, but he was stopped in five rounds. Pulev wasn’t ready to take on the much experieced and powerful Wladimir at the stage in his pro career. Although Pulev had a long amateur career, he wasn’t mixing it up with guys with Klitschko’s size and talent. Besides his win over Hughie Fury, Pulev has past victories over Samuel Peter, Dereck Chisora, Alexander Ustinov, Kevin Johnson, Tony Thompson, Joey Abell, Alexander Dimitrenko, Matt Skelton, Derric Rossy, Paulo Vidoz, and Travis Walker. 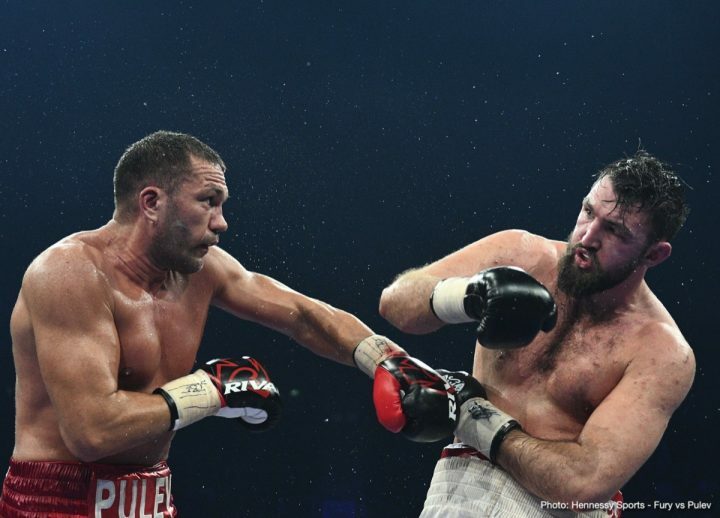 It took Pulev a little longer than expected to ramp back up for another world title shot after his loss to Wladimir. As already stated, Pulev would have already challenged Joshua in October 2017 if not for suffering a shoulder injury.